We all pawtied and now it's time to vote for Katie and Blind Cat Rescue! Thanks to all the anipals who attended our big bash Monday night. The house was packed and everyone couldn't wait for the polls to open. Electricity was in the air! Thanks also to those who donated their time and those who donated prizes. 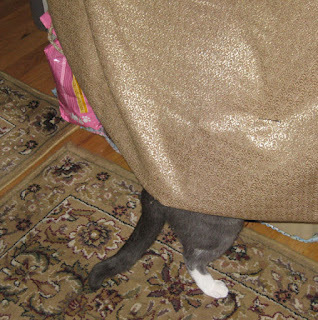 We won't find out how successful the pawty was until the polls close and the results are tallied. 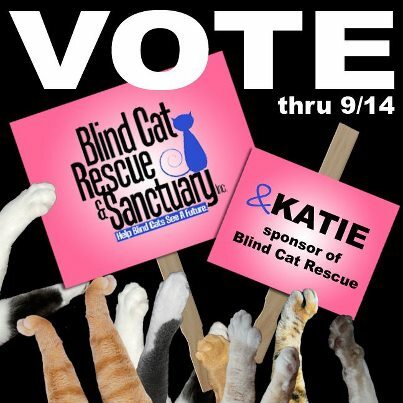 VOTE Blind Cat Rescue and Sanctuary, Inc. & Katie in the Campaign For A Cause Contest! Help this amazing shelter win $7500 in food/supplies/cash! YOU can make a difference with just a click. One vote per person/computer - Thru 9/14. Campaign Manager. I'm stunning so who can blame them. We love that Blind cat shelter. May the best kitty and shelter win, but they are all good. How to decide. CK, y'know what?? We haven't voted yet because we can't decide who to vote for. We love all the shelters and groups!! But don't worry...we will decide and cast our vote! Vote is a very good word! We voted CK, love the picture of you in the voting booth. Man, those pawparazzi are everywhere! My human is busy getting out the vote today! Yes, I finally put her to some good use! CK, wes has done the job of campaign magers well! Kudos to yous dear friend! Me had a great time! We can't believe she snapped one of you while voting! 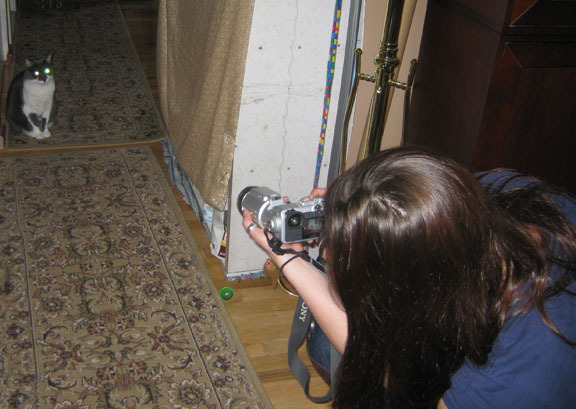 The pawparazzi will do anything to get a pic published! We voted! Darling, I can't believe you sat still for all that. And hey--you Human's just a whippersnapper. I don't see a gray hair on that head! Good luck , paws crossed. Have a terrific Thursday. What the??? Where on earth did my comment go? ...must have been the innernets gremlins! Glogirly said she felt like she ran a marathon without ever moving her legs. I think she's too old for that kind of Twitter pawtying! You and the anipals threw the best pawty EVER! Love was in the airwaves! Poor girl, chased down by pawparazzi even in the voting booth! Love the video that was "your" idea! We have voted. CK you need to tell the pawparazzi that the voting booth is private and wait until the press conference for some publicity pictures. Oh....she's not your Mom! Well, i thought that looked like a pretty fancy camera ;-) So you didn't like my Mankini, eh? When will the winner of the Big Election be announced? ?